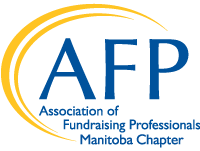 The Manitoba Chapter of AFP was chartered in 1996. We are one of 21 chapters in Canada and more than 200 worldwide. Our association brings together individuals and organizations that serve their communities in many ways, through a variety of sectors, representing a wide range of demographics, each driven by mission statements that tackle some of society's most important issues. Our members participate in regular professional development activities, certification training and education, networking opportunities and recognition events like the Manitoba Philanthropy Awards. Through the hard work of our volunteer board and committees, the chapter delivers programming that supports our members and equips them with the tools they need to be successful in this rewarding work. Increasing awareness of AFP in our community.